Two recipes for the price of one! In the April 2010 issue of Food and Wine there was an article on great 60 minute meals, and these were both part of the “Steak Dinner, Italian Style” meal. With some changes. The Gorgonzola deliciousness was originally mushrooms and onions, but swapping out potatoes worked perfectly. And I did not make the polenta. And I only made 1 lb. 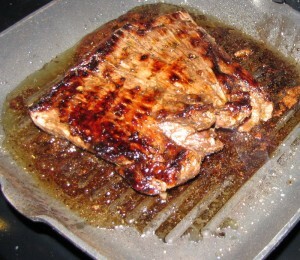 of flank steak instead of the 2.5 lbs. called for in the recipe, but I made the full amount of marinade. That was just me not thinking about it at the time, but it was nice having the steak good and smothered. This was super delicious, and most of the hour was hands-off waiting time. So that was also pretty excellent. 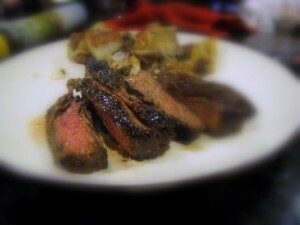 PLUS, I’ve discovered the joys of Picasa’s soft focus feature when editing my pics. Look out, world. Preheat the oven to 425 degrees F. On a large rimmed baking sheet, toss the potatoes and onions with the oil and season with salt and pepper. 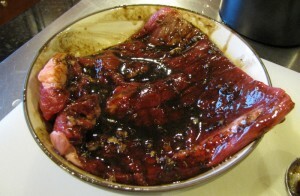 Roast for about 30 minutes, until tender, tossing once. 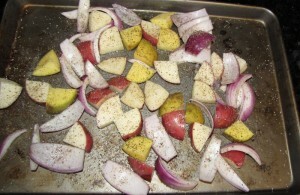 While the vegetables roast, combine the vinegar, oil, garlic, and thyme in a blender and puree until smooth. 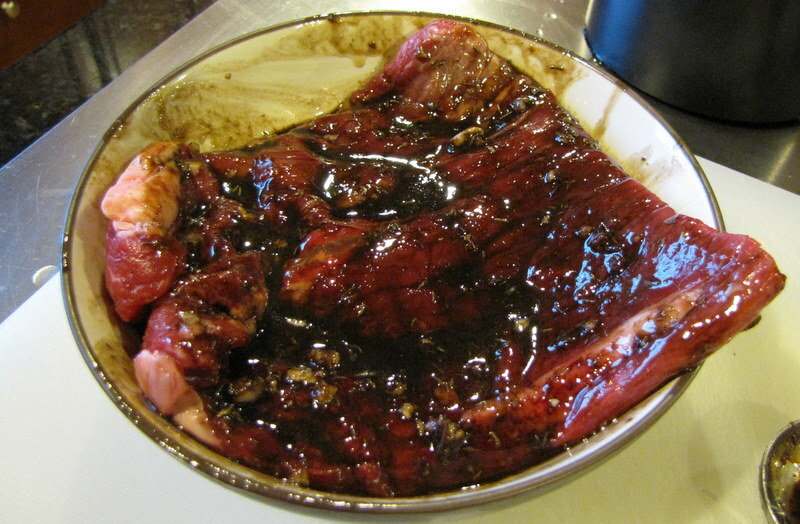 In a large dish or bowl, pour the marinade over the steak. Let stand for 5 minutes. Heat a grill pan. Season the steak with salt and pepper. Grill over moderately high heat, turning once, until medium, about 8 minutes per side. Transfer the steak to a board and let stand for 10 minutes. 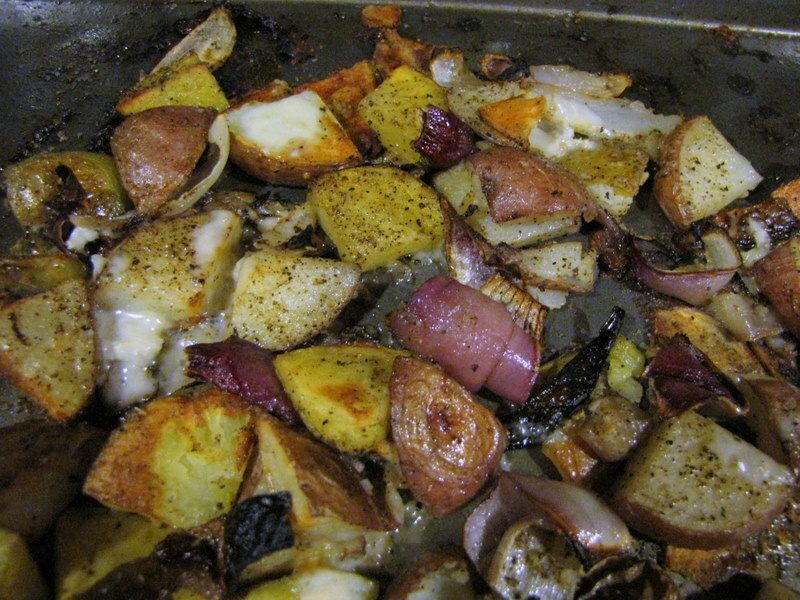 Take the vegetables out of the oven and sprinkle with thyme. Sprinkle with the Gorgonzola and roast for about 5 more minutes, until the cheese is melted. Transfer to plates, slice the steak, and serve all together.